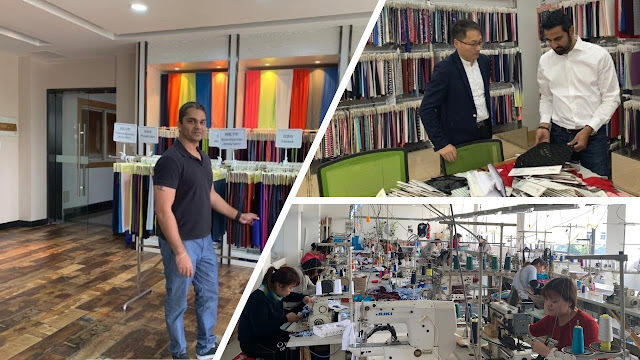 I recently visited China to source fabric and onboard manufacturing plants for my performance sports apparel company. As someone who worked in the apparel sourcing for various companies in the past, I have visited China many times, though my most recent visit came after a gap of few years. My first impression was astonished disbelief in the incredibly rapid development the Chinese have made in terms of infrastructure. Freeways run miles long on top of each other; some places there are two or three freeways that run parallel to each other. Public transportation is now more developed and dependable than ever. Most cities are now connected by bullet trains, which have cut travel time by almost 40%. I had the privilege to visit multiple cities in search of knit and woven fabric mills along with manufacturing plants capable of handling woven and knit products. Some of the cities I visited included, Shanghai, Nanjing, Xiamen, Hangzhou, and Guangzhou. All are well-known apparel hubs. The Chinese domestic market is very strong and is booming at an exponential rate. In 2017, the total domestic apparel industry was worth $210 billion USD. It is now projected to grow to $225 billion USD by end of 2019. With a population of 1.38 billion, manufacturing plants have more revenue sources available than they have ever had. Many companies prefer to work for domestic buyers and retailers as doing so is less complicated and more cost effective due to simple supply chain operations. As a result of strong international and domestic demand for Chinese production capacity, manufacturers have the ability to demand higher SMR (Standard Minute Rate) to produce their products. One of the most significant findings during my visit was that China is no longer cheap, especially for those buyers who wanting quality products from a manufacturing plant compliant with all ethical and labor requirements. In some cases, prices offered are higher than those currently offered in countries like Sri Lanka. For example, a standard button-down shirt requiring a standard minute value (SMV) of 18 was quoted with a cut and make cost (CM) of $3.80 (CM). From my experience, I know I could easily source that same shirt from Sri Lanka for $2.70 (SMV 18 x $0.15). China’s price increase is mainly due to rising wages and increased the cost to manufacturers as most companies now offer employee transportation to and from the factory, three daily meals, and other financial benefits to all employees. This was not at all the case only a few years ago. As mentioned above, although I saw many positive, progressive adaptations practised in many manufacturing plants designed to improve efficiency, one of the most interesting yet disturbing findings during my trip was witnessing the poor-quality assurance systems used in many plants regardless of location or size of the company. In fact, most factories I visited did not follow standard quality control systems often employed in manufacturing plants across South Asia. Systems such as the “traffic light system”, “one in seven”, “flag”, or light systems were not used. When asked why these known and tested quality control programs were not in place, the factory managers I spoke with were adamant that necessary checks were done prior to packaging and that operators were trained to avoid mistakes. Of the few factories I visited that were owned and managed by European companies with reputations for high quality output, their attention to quality was equally poor. My typical experience in many other parts of the world has been quite different when it comes to how quality control is managed. Specifically, I’ve seen that if a buyer requests that a certain quality procedure be put in place during the manufacturing process, and if factory management thinks that the requested procedure is better than the system currently in place, that factory’s management team will often change the entire quality control procedure on the factory floor to the better system requested by the buyer. This then gives the factory a better opportunity both to follow a more thorough quality control procedure for that particular customer and to promote their claim to other customers that they have a much more vigorous quality control system in place. This type of thinking and action, however, was not in place at many of the Chinese manufacturers I visited. I, therefore, find it advisable to closely monitor the quality of products in the line when it comes to evaluating and sourcing factories. Regarding appropriate due diligence, there is now another consideration to take into account when evaluating Chinese sourcing. Beginning in January 2019, tariffs to ship most Chinese made products to the US is expected to increase by 25%. This, too, is going to make Chinese made products less competitive. As this article points out, there are many considerations to take into account when looking to source overseas – or anywhere for that matter. It is usually not just one factor that makes or breaks a deal but instead a combination of factors. It is therefore critically imperative to know and understand a factory’s – and nation’s - comprehensive strengths and weaknesses to frame a sourcing strategy most effectively. Apparel sourcing from China, the cost of apparel production in Chinese factories, Latest development in infrastructure in China.